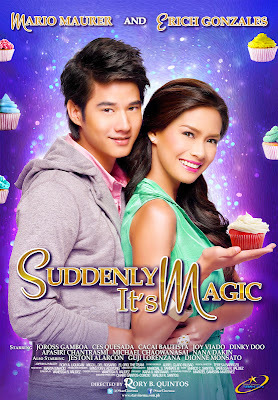 Star Cinema's Suddenly It's Magic starring Mario Maurer and Erich Gonzales grossed P25.87 million on its first 5 days of showing in over 100 theaters nationwide. The romantic comedy flick debuted on the third spot for the period of October 31 to November 4 according to Box Office Mojo. The box office gross of Suddenly It's Magic failed to satisfy the expectations of many although we cannot consider the movie as flop. Meanwhile, A Secret Affair had now a total gross of P95.17 million after 2 weeks in cinemas while This Guy's In Love With You Mare raked in P238.78 million in 4 weeks. Tiktik: The Aswang Chronicles managed to hit P69 million in a span of 3 weeks. The number 1 movie for the period is the James Bond movie Skyfall which already had P77.26 million box office gross in just 5 days. 4. Kimmy Dora and the Temple of Kiyeme - P133.34 M.
@ queenie :wave: Napadaan lang. Nakita ko kasi may bagong bahay na uli. Balik ako mamaya sa graveyard shift. See you! ABS-CBN's noontime show It's Showtime continues its winning streak over rival Eat Bulaga according to the nationwide TV ratings data provided by Kantar Media/TNS. However, no noontime show nor afternoon show can beat Jodi and Papa Chen's tandem in Be Careful With My Heart which is still the number 1 show on daytime. John Lloyd Cruz and Bea Alonzo's teleserye A Beautiful Affair pilot week rewind beat Marian Rivera's Temptation of Wife rewind on Sunday, November 4. Both series premiered on the same day and at competing timeslots. A Beautiful Affair emerged victorious on it's pilot week. Meanwhile, Be Careful With My Heart Sabado rewind and Wansapanataym topped Saturday daytime and primetime viewing, respectively last November 3. Award-winning anchor Korina Sanchez is giving away P3,000 everyday for Christmas and as much as P15,000 before New Year in her radio program Rated Korina on DZMM. Tune in to DZMM Radyo Patrol 630, DZMM TeleRadyo, or dzmm.com.ph for a chance to be a lucky winner of P3,000 in Libreng Pera sa Paskong Masaya until December 28. To join, listen to the program at 10 a.m. on weekdays and answer the rated question that is obtained from Korinas talk and discussions in the program. Wait for her cue and text DZMM (space) REACT (space) your complete name, address, age, telephone or cellphone number, and your ANSWER and send it to 2366. Rated Korina will be giving away bigger cash prizes on New Years Eve, December 31 so be sure to watch or listen to the radio show for the grand draw of all the entries in which three lucky winners will win P5,000; P10,000; and P15,000 in cash. Ted Failon, meanwhile, is handing out Digiboxes in Failon Ngayon sa DZMM via the seeding program mahiwagang back pack at mahiwagang black box or Digibox that goes around different parts of Metro Manila. The hit promo draws motorists, taxi drivers, and DZMM listeners who enthusiastically line up for their chance to guess the featured sound bite and win a Digibox. 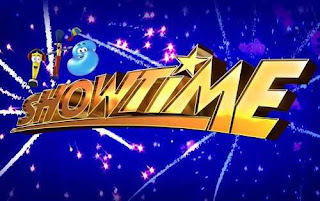 It is part of ABS-CBNs test broadcast and promotion of Digital Television (DTV), a high-tech standard that uses digital signals for broadcast. DZMM TeleRadyo will be one of the free channels to be unveiled when ABS-CBN DTV is formally rolled out. 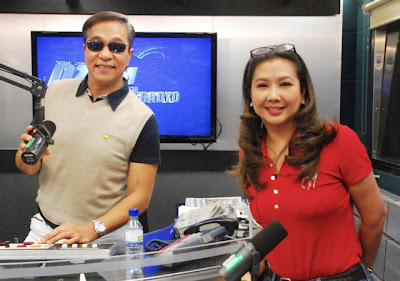 Tune in to Failon Ngayon sa DZMM at 8 a.m. from Mondays to Fridays as Ted dissects the biggest and most significant national issues, and to Rated Korina at 10 a.m. for important and practical information for your everyday life and analysis of the latest news stories. Catch them on DZMM Radyo Patrol 630, DZMM TeleRadyo (SkyCable channel 26), and online via dzmm.com.ph. For updates, follow @DZMMTeleRadyo on Twitter or like www.facebook.com/dzmmteleradyo. The Philippine National Police (PNP) has filed murder charges on Monday against a reality television star and his cousin for the death of a court sheriff who suffered serious head injuries after being being mauled near a drinking joint on the first night of the Peñafrancia festival last September 7, police said Tuesday. PO2 Alexander Lapid, police investigator, said Larry Martin, winner of the reality show Biggest Loser, and his cousin Faustino Galvan, would face murder charges for the death of Rommel Licmoan, a court sheriff of a regional trial court in this city. Lapid said Galvans girlfriend had confessed to police that on the evening of Sept. 7, Galvan had rushed to the drinking joint after she called him for help as Licmoan was allegedly making sexual advances at her at the drinking establishment. Investigation showed Galvan punched Licmoan at the back of his head, causing him to fall on the pavement. Licmoan was rushed to the hospital where he was in coma for two weeks before he died. A witness pointed to Martin as the driver of the car who accompanied Galvan to the scene. Martin allegedly stepped out of the car and checked on the victim before fleeing with his cousin. Martin emerged winner in season 1 of ABS-CBNs The Biggest Loser Pinoy Edition in 2011, which showed showed overweight contestants undergoing gruelling challenges to lose the most weight for the top prize of P1 million and a new house. Martin was mum on the murder raps but said his lawyer would just answer the allegations in court. Folded and Hung has released a teaser photo for its Holiday 2012 campaign featuring Angel Locsin. This marks Angel Locsin's return to the ad campaigns of the said brand. Angel Locsin is glittering as gold in the campaign photo posted by Folded and Hung on it's official Facebook page. It's been quite a while since Angel Locsin appeared on a major campaign by F&H but recently, Angel was tapped to banner the brand's line of salon, Folded and Hung Famous Salon together with Sam Milby and other F&H endorsers. Angel Locsin has been busy doing movie projects the past year but this 2013, Angel Locsin is said to be back on television and according to reports, she will be paired with Coco Martin. Let's hope this dream project will come to life. Andrew Wolff will be leaving for Kent, England this Friday to represent the Philippines in the Mr. World competition to be held on November 24. He is also a part of the National Rugby Team which recently qualified for the 2013 Rugby World Cup. 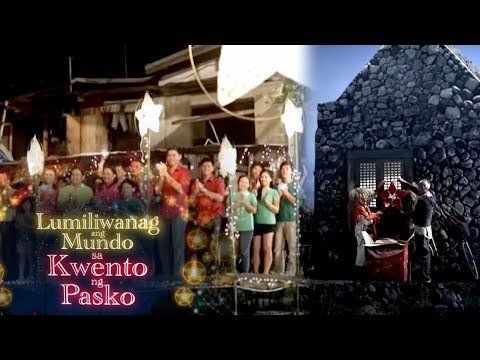 parang tumaba ulit si larry martin based doon sa video na ipinakita ng tv patrol kaya siguro di sya kasama sa tvc ng mga BL winner.